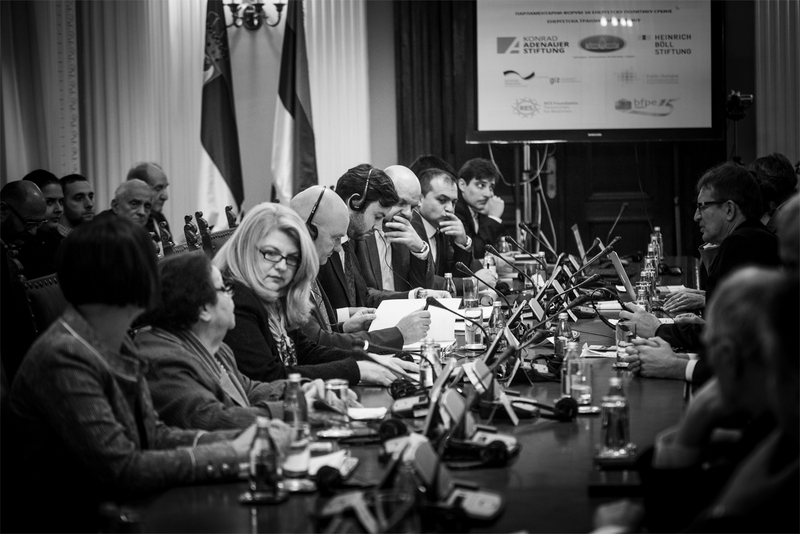 The dialogue focusing on energy transition in Serbia was organised within the Sixth Parliamentary Forum for Energy Policy, which was held in the National Assembly of the Republic of Serbia. The meeting was organised in cooperation with German Agency for International Cooperation (GIZ), Belgrade Fund for Political Excellence, and Heinrich Böll and Konrad Adenauer foundations. Aleksandra Tomić, presiding over the work of the Parliamentary Forum for energy policy, H.E. Thomas Schieb, the Ambassador of Federal Republic of Germany, Norbert Beckmann-Dierkes, director of Konrad Adenauer Foundation in Belgrade, and Simon Ilse, director of the Heinrich Boll Foundation in Belgrade addressed everybody present. Dr Aleksandra Tomić has announced the resumption of the dialogue about Serbia’s energy transition, which, as a small country has to keep up with the world in the field of innovations. Digitalisation and new technologies are accelerating new movements and creating new markets, therefore, the support coming from Germany, which is the leader in the sector of software technologies, is extremely important to Serbia. She also indicated that Serbia actively participates in energy transition of European Union by being a member of Energy Community. Ambassador Schieb has pointed out that this Forum represents traditional cooperation between Serbia and Germany in this field. He explained that experiences that Germany has in the field of energy policy are proving that energy transition functions and that Germany is a pioneer in this field (starting from the 80s). He also indicated that energy transition provides great opportunities in terms of job openings. He stated that structural changes should have the support of political leaders, and that energy transition is not a race; it is a marathon. 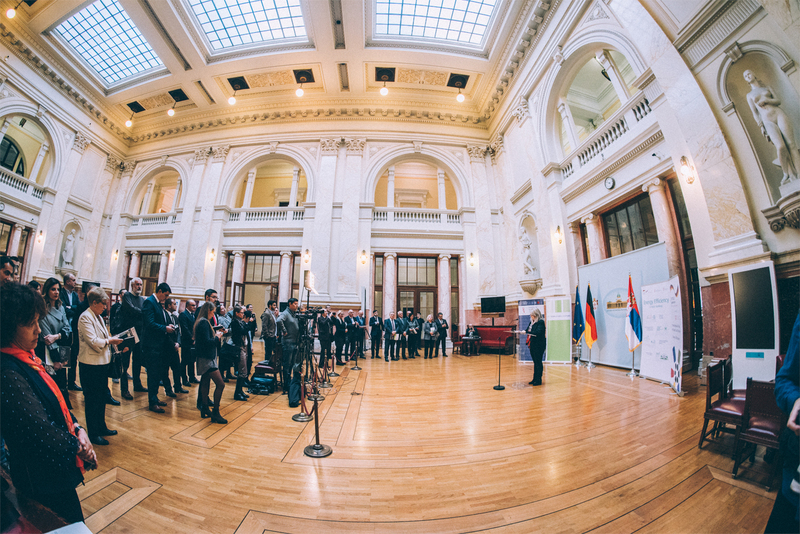 Energy policy is a central part of the cooperation between Serbia and Germany, and this conference is an example in favour of such cooperation. Norbert Beckmann-Dierkes, director of Konrad Adenauer Foundation in Belgrade, said that the fact that this topic is gaining more and more public response is of great importance. Responsible energy policy means leading the policy in such direction that will secure the resources we have, and which generations to come need; and, as such is a matter of sustainability and responsibility. Simon Ilse, director of the Heinrich Boll Foundation in Belgrade, indicated the significance that this topic has in relation with economy and climate goals. Energy policy is no longer the focus of green parties only; now is in the focus of the entire society. He pointed out that energy transition belongs to the citizens because today, besides being energy consumers, they are also energy producers. The discussion was mainly focused on energy efficiency in schools and preschool institutions, and good examples of breaking the barriers for applying the new technologies for producing the energy from renewable resources. Sonja Licht, president of Belgrade Fund for Political Excellence moderated the panel on energy efficiency in schools and kindergartens. She thanked GIZ in Serbia, and its Open Regional Fund for Southeast Europe – Energy Efficiency (ORF-EE), with head office in Sarajevo. Svjetlana Đokić, Senior Project Manager with GIZ, thanked everybody for participation and cooperation; she pointed out that the project “Energy efficiency in public buildings in Serbia” provides support for national institutions in the process of full implementation of relevant European directives in the field of energy efficiency; especially when it comes to implementing the National Action Plan for energy efficiency through relevant set of regulations. Dr Dušan Ignjatović, Associate Professor of Faculty of Architecture, University of Belgrade, spoke about the history of energy efficiency in building. He stated that Faculty of Architecture in Belgrade is a pioneer in this field and with the support of GIZ, has participated in many EU projects like TABULA or EPISCOPE. 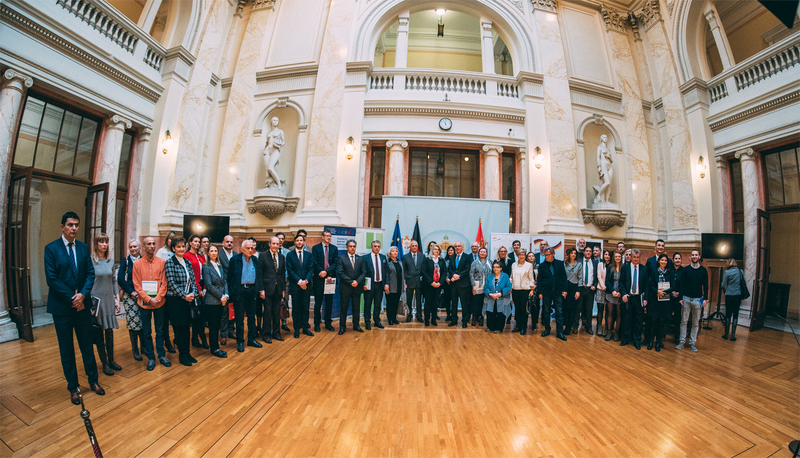 The focus of on-going project of Serb-German development cooperation “Energy Efficiency in public buildings”, carried out by GIZ, are schools and preschools. One of the results of the project activities is a study “National typology of schools and preschools”. Dr Ignjatović has additionally pointed out on the significance and potential for investment in energy efficiency measures with special focus on tools and instruments; Information on which is displayed at the Energy Efficiency Knowledge Platform. One of the most important projects since 2009 is the “buildings inventory” with the focus on improving energy efficiency. Citizens are now able to find out how efficient their house is, and what should be improved. Aleksandar Macura from RES Foundation, author of the study “Analysis of National System of Cost Financing in the Field of Energy and Energy Efficiency in Schools and Preschool Institutions” discussed current legislative and institutional frame. He spoke about the roles in the chain of financing, ownership of facilities, average annual budget for energy efficiency, available funds, importance of housekeeping of the facility, and about good and bad examples of implementation of energy efficiency in schools and preschool institutions (amounting to 6000 facilities in Serbia). 4. Reference values of funds for energy consumption. There is more public money, and access to resources is much easier than before, but the quality of projects is questionable. The starting point should be to determine person responsible for energy efficiency, as well as using (the presence of) parents to raise awareness, and to organize trainings for people in charge for the specific type of building they work in. Energy efficiency programs at the level of local self-governments have not been sufficiently used, but there is pressure, which is marked as positive. He noted that in certain percentage of buildings there was a deterioration of air after the application of EE measures, which shows how important is that we know what engineers are doing. Aleksandar Perić from the Municipality of Ljubovija, spoke at the panel, and pointed out that energy efficiency is still a topic that is not understood enough, and it is still considered as an expense, and not as an investment. He also noted that about 60% of public facilities are educational institutions and that this represents an enormous burden on the budget. He considers Ljubovija different from the other municipalities to some extent, because there was and is political support for necessary measures. Energy rehabilitation of schools and preschools is recognised as extremely important. Savings in energy bills have already left enough space for the money to be invested in other fields. Energy efficiency in schools and preschools means better quality of stay and work in these facilities, both for children and employees at the same time. Ljubovija should serve as an example to other municipalities and cities: the biggest investment is the complete reconstruction of schools in Serbia, with heating systems needed to provide for 2 other public buildings which is a great saving. 7 buildings have been repaired so far, and savings are up to 50%. Up to 15 million dinars are saved at the annual level. In the second panel, Damjan Rehm Bogunović from Heinrich Boll Foundation spoke about the obligations of Serbia towards the Energy Community, and stressed that lawmakers must remove barriers for using the new energy sources. Energy efficiency is always a natural first step; however, it is also necessary to introduce sustainable energy sources, and there are many challenges to this. Simon Ilse discussed energy transition in Germany. He made parallels with Serbia, where he specifically pointed out coal and coal commission. Furthermore, he also mentioned questions of citizens’ about solar panels that houses in Bavaria have. Ana Đokić, from “Who builds the city” Association presented a case study – an attempt to install solar panels on a house in Dušanovac. She talked about the motivation for such an attempt, the technical and administrative barriers the project encountered, and the current state of affairs. She also made a review of the graphics presentation of administrative and technical “travel” and barriers. Jasminka Young, from the RES Foundation, presented the study of this Foundation on the removal of barriers to renewable energy in Serbia. She pointed out that when it comes to renewable energy sources in Serbia there is a great inconsistency and uncertainty. She also made an overview of the existing barriers as well as how to get started with removing them and repairing the system. Based on what was discussed, Đorđe Popović, CmS Law, made conclusions on the energy transition in Serbia with a focus on law and administration. Forum was concluded by dr Aleksandra Tomić, who thanked everybody for their participation. At the same time, she summed up the overall discussion on energy efficiency and the removal of barriers for renewable energy, prposing where to start with the removal of barriers and what will happen if we do not do so.